History doesn't repeat itself. It just never stops. The Baltimore Colts were once considered a model NFL franchise. They had a winning tradition, thanks to the likes of Johnny Unitas. The loyalty of the Colts' Baltimore fan base was unmatched anywhere outside Green Bay. They were a blue-collar bunch who connected with their city as much as any football team. Then, in the middle of a snowy night back in March of 1984, the team and its legacy was loaded up in a caravan of moving trucks and shipped itself to Indianapolis. Robert Irsay, who's son Jim won the Lucky Sperm Lottery and got the Colts after dad died and he edged out his step-mom in court, famously said "I have not any intention of moving the God-damned team. If I did, I would tell you about it." They did, and he didn't. The day the Colts left town, a TV station asked one famous fan if another team in Baltimore would help Baltimore forget the Colts. "You'll never forget the Colts," he said. That was 30 years, one Ray Lewis plea deal, and two Ravens Super Bowl wins ago. The Colts, meanwhile, have become as Indianapolis as the 500, thanks to both Peyton Manning and Andrew Luck. These tales of team-swapping may seem like Ancient Greek history to NFL fans in New England. But your New England Patriots once came perilously close to following the same path as the Baltimore/Indianapolis Colts, the Cleveland Browns/Ravens, the Cleveland/LA/Anahiem/St. Louis Rams, the Chicago/St. Louis/Arizona Cardinals, and the Oakland/LA/Oakland Raiders. The Patriots enjoy unmatched status as an NFL empire. Thoughts of them not playing in Gillette Stadium for the next 1,000 years seem about as foreign as Bill Belichick pondering what to do with the No. 1 pick in the NFL draft. Yet is was just a shade over 16 years ago, that the Patriots and Robert Kraft had a signed deal to follow in the footsteps of the Redskins and leave the Bay State. For years, the Patriots were always moving somewhere. They played their "home" games in Harvard Stadium, Fenway Park, Nickerson Field, Alumni Stadium, and, once, even in Alabama. The team went through a series of owners after the Sullivan Family, including one who was about to move it to St. Louis before he sold to Robert Kraft. But it was the move to Hartford, back in 1998, that seemed all too real. It was done deal. There was Kraft shaking hands with the governor of Connecticut. Plans were laid. Money was committed. The NFL was on board. Hartford, the world was told on Nov. 19, 1998, would become the new home of the Patriots starting in the 2001 season. 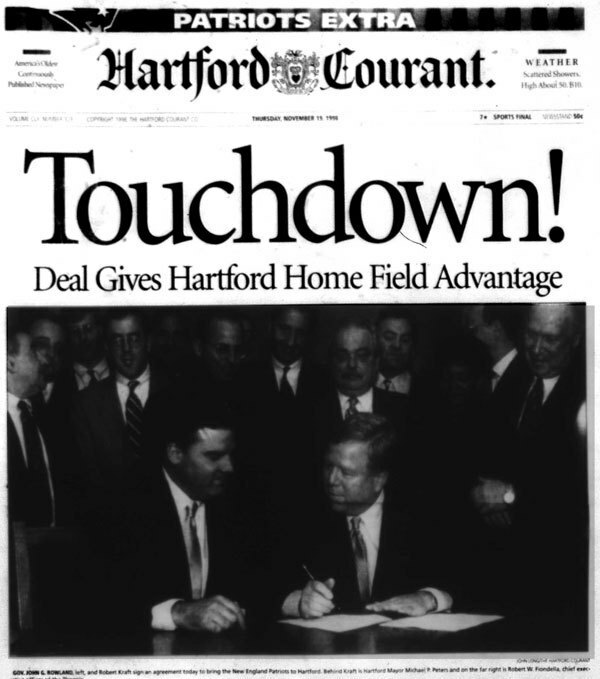 The front page of the Hartford Courant featured "Touchdown!" as its lead headline, complete with a photo of then-Gov. John G. Rowland and Kraft signing an agreement that would eventually re-locate the Patriots to the Nutmeg State. As the Courant's Paul Doyle recalled in 2014: "The state would build a $374 million stadium in downtown Hartford and the Patriots would relocate in 2001. After a decade of flirting, Hartford and the Patriots were making a commitment." The Patriots-Connecticut timeline stretched back to 1988, when Bridgeport and Remington razor magnate Victor Kiam bought the team. One of his partners, Fran Murray, started talking up Hartford as a potential home. But Kiam eventually sold out to James Busch Orthwein, who seemingly was ready to move the team to St. Louis on Day One. Two different groups tried to then buy the team from Orthwein, both with eyes on Connecticut after state legislators agreed to build a 70,000-seat, $252 million stadium. They failed. Eventually, Kraft bought the club. Never satisfied with the dump that was Schaefer/Sullivan/Foxborough Stadium, his search for a new home began in earnest. Kraft and NFL Commissioner Paul Tagliabue met with Gov. Rowland and Connecticut business leaders. 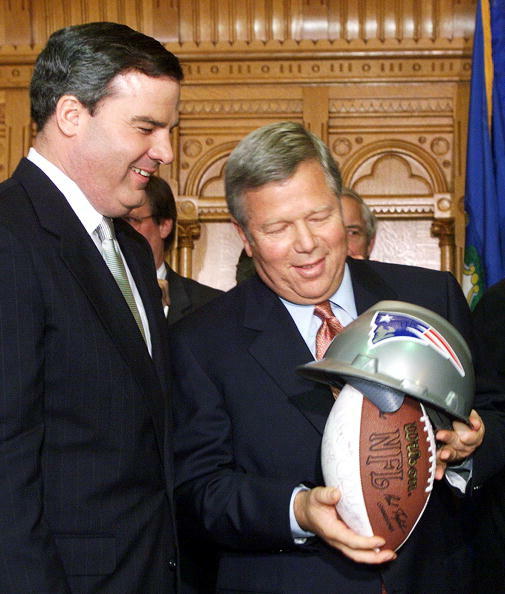 When the Massachusetts legislature failed to finance a stadium for the Patriots in July 1998, talks with Connecticut heated up. Hartford was used as bait, many believe, to get the State of Massachusetts to kick in $70 million in infrastructure improvements in Foxborough, NFL loan guarantees, and commitments from the Boston-area business community for luxury suites. Once those were secured, Kraft pulled the plug on Hartford on April 30, 1999. He, according to the Courant, cited delays in construction as the reason. For many living in Connecticut at the time, like myself, it was a deal that always seemed too good to be true. For many Nutmeggers, the demise of the Hartford Patriots was as much expected as it was feared. The May 1, 1999, front-page headline, conceived by Courant editor Brian Toolan, read: "DEAR JOHN. ..."
Connecticut did get a new college football stadium on the east side of the Connecticut River. Kraft would soon rule over a franchise that won three Super Bowls, went to two more, plays in its ninth AFC title game during his reign on Sunday, and strip-mines millions of dollars each season in concession, parking, and advertising revenues at Gillette Stadium. Rowland, on the other hand, resigned from office and went to federal prison for 10 months after pleading guilty to fraud charges in 2004. And just last year, he was convicted of six felony and misdemeanor charges � including obstruction of justice � for conspiring to violate federal campaign reporting laws. He faces up to 57 years in prison and is currently awaiting sentencing. He won't be in Kraft's owners box on Sunday, either.